Resumes are key in showcasing one’s skills and abilities to prospective employers and as such they require scrupulous attention to details when designing them. The strength of a resume lies in two aspects: the content and the visual lay-out. What matters to us here is the lay-out part for the content part is your work. Creating visually appealing resumes can make a huge difference in the impression recruiters can have about you. Luckily , there are now several tools you can use to craft a professionally looking resume. 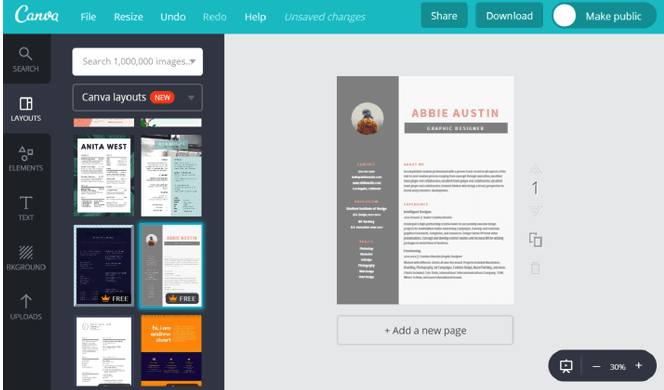 We have already reviewed some of them in the past and today we are sharing with you another excellent one: Canva resume maker. Canva, the popular infographic creation tool, offers a wide variety of beautiful and creative resume layouts students can use to design and share their resumes. Using an intuitive drag and drop editor, students can easily edit and customize resume layouts the way they want. They can add pr remove sections, change text fonts, change backgrounds, add visuals and when they are done they can save and share with others.